My Simple Japanese Garden How can you protect your crops? Having my own poultry-yard has proven quite useful in terms of getting eggs and meat both from chickens and other fowl. 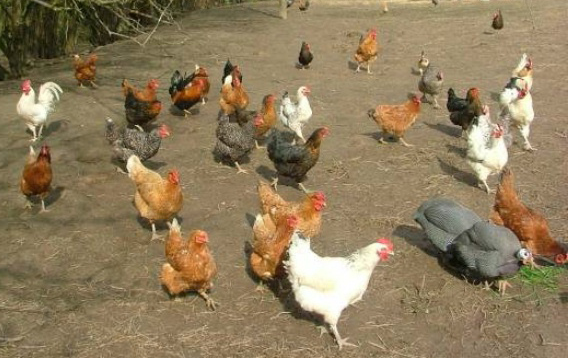 Setting up a poultry-yard in your backyard is not difficult at all, and even a novice can try his/her hand at raising some chickens for food purposes. Recent concerns over how commercial chickens are raised and the feed that they are given has pushed people like you and me to prefer home-grown poultry products. It is also quite fun! Excited beginners will tend to jump right into stocking chicks or hens, but careful planning is necessary for healthy chickens and a good produce. The first step is to figure out the amount of space that a coop will require and where in your yard to position it. The selected ground must be relatively even and have some grass. Rather than building the coop from scratch, I considered ready-made coops that can be bought. There are portable styles as well, which make it very convenient to position your chickens on fresh vegetation patches periodically. A portable pen that is 4′ by 8′ with its 4′ by 4′ coop is sufficient for housing 4-8 hens, but aiming for the largest possible poultry-yard you can provide is the best. Good feed consisting of scratch grains, scraps of fruits and vegetables, bugs, grit for grinding and oyster shell for calcium is essential, as is plenty of fresh water for laying hens. When I let the hens grow free-range, they forage for insects themselves when let out of the pen and it leads to healthier growth and better quality eggs. Temperature control is paramount in accordance with the season. In winter, investing in a heating lamp will keep poultry warm and cosy, and plastic coverings can help keep draughty winds at bay. Mixing warm water with feed is good for chickens when temperatures reach freezing point. Adequate ventilation must be ensured. Chickens will need protection from all-weather elements – and also from predators! Have sturdy fencing and wire coverings over the pen. Raising Chickens – Chicks, Hens Or Roosters? The general advice for beginners is to not invest in a rooster if you only intend to raise hens for table eggs. Roosters can be noisy backyard residents which will not do well to raise the repute of a novice among neighbours who are already annoyed by the clucking and the smell! As a side note, keeping the pen and chicken-keep clean is a very important hygienic requirement. Raising chicks can be a little daunting for the first-time owner, so beginners would do better to start with full-grown hens for immediate harvesting of eggs during the season.